The archives of a North-East museum are providing a fascinating insight into the railway workers who gave their lives to help the war effort. Vicki Henderson reports. THE heavy casualties sustained by the North Eastern Railway (NER) during the First World War are to be laid bare thanks to a Lottery-funded project. Volunteers have spent months scouring the archives of the Head of Steam – Darlington Railway Museum to build up a picture of the 2,236 railway workers from around the region who lost their lives. The North Eastern Railways in World War One project, made possible with the help of a £42,000 grant from the Heritage Lottery Fund, is aiming to put a name and a face to each of the casualties and provide an online resource for future generations. Leona White-Hannant, the museum’s curator, says the project is about preserving the memory of NER workers who fought and died. “The people who worked for NER came from across the region, not just Darlington,” she says. “A lot of soldiers formed what were known as Pals Battalions and the NER workers joined the 17th Service Battalion in the Northumberland Fusiliers, which was also called the Railway Battalion. 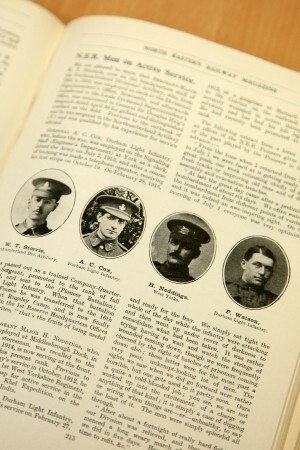 Museum staff are working alongside a keen team of volunteers to cross reference the roll of honour of those who were killed and injured, published each month in the NER’s own staff magazine, with the company’s records. Mrs White-Hannant says: “The NER’s magazines are incredibly detailed for something published each month. The project is also about preserving the historic archives that lie in the museum’s Ken Hooley Study Centre – the delicate registers and records are all being scanned as part of the project before being re-bound so that future researchers can use the electronic archive and reduce the need for handling the paper copies. Although the team of 15 volunteers, who work in pairs over three days each week, have been working on the project since April, the scale of the losses mean they have only reached July 192016 – shortly after the Battle of the Somme. Volunteer Jim Whitton, who signed up for the project through an interest in family history, says: “It’s quite daunting looking at the Roll of Honour for July 1916 – there are just pages and pages of people who died. Mrs White-Hannant adds: “We’ve seen records of people aged from 17 to 40, which means some lied to go out to fight. “When these workers went off to war it meant the railways back at home lost skilled men – you can’t train up an engine driver quickly. “Eventually, the government put a stop to fire men and engine drivers going off to fight by giving them an exemption but women came in to fill other jobs traditionally seen as male roles. As part of the museum project, a tribute to the lives lost among the railway workers is being created by a team of keen knitters who have been working to produce woollen poppies, one for each casualty, that will be joined together. Mrs White-Hannant is keen to hear from anyone who might have stories of family members who were railway workers who fought in the war but would particularly like to hear about engine drivers or fire men who stayed behind and the women who took on railway jobs. She adds: “I don’t think people realise the wealth of information we have here at the museum and it’s lovely to do a project like this and make it more available to people. 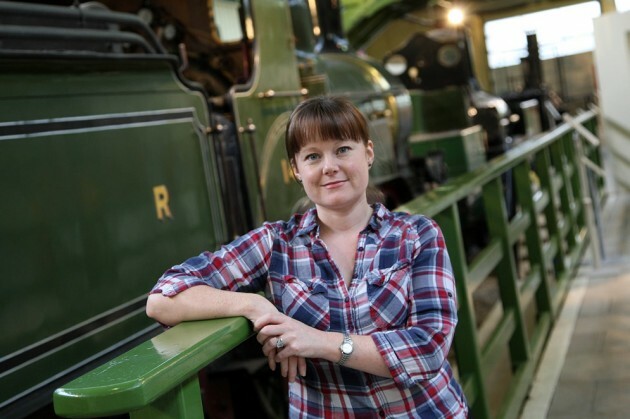 “It is about the railways but it’s also local history, family history and military history.